The "Occide Jeanty Music Academy or the Academie Musicale Occide Jeanty (AMOJ)" was founded by Pastor Jean Enock in Cité Soleil on August 6, 2006. 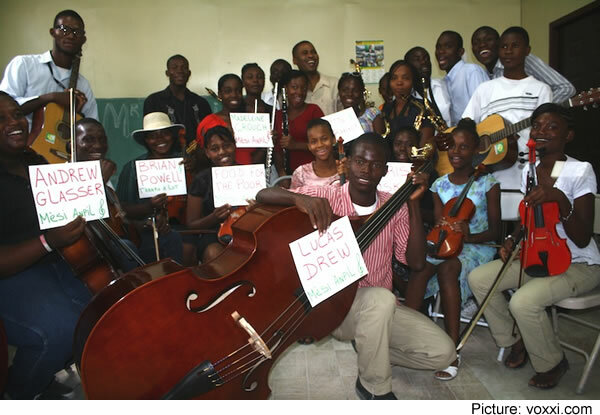 Pastor Enock was born and brought up in this suburb of Port-au-Prince with a dream in his mind to set up a "Haitian Youth Orchestra" which will provide an alternative to the children and adolescents who were once falling prey of gang violence (known as "Operation Bagdad") which ravaged the community between 2004-2007. After 10 years of Pastor's hard work and with its present 250 AMOJ students, the music academy has been successfully reduced the violence and misery in Cité Soleil. The most of the students come from extremely impoverished backgrounds; contribute a nominal fee to participate in the program under a small team of part time teachers. Their parents have reported substantial improvement in the characters of the children. They have become responsible, punctual and disciplined after joining the group. This is the only important artistic event in the community and a source of pride for them.